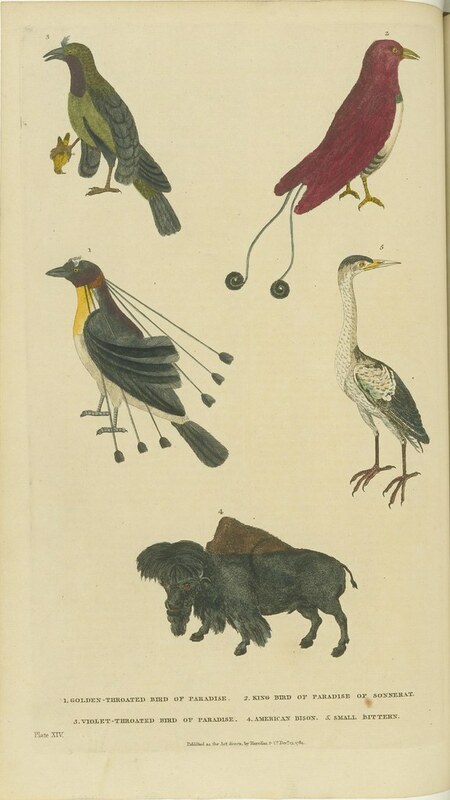 'A New Dictionary of Natural History; or, Compleat Universal Display of Animated Nature. 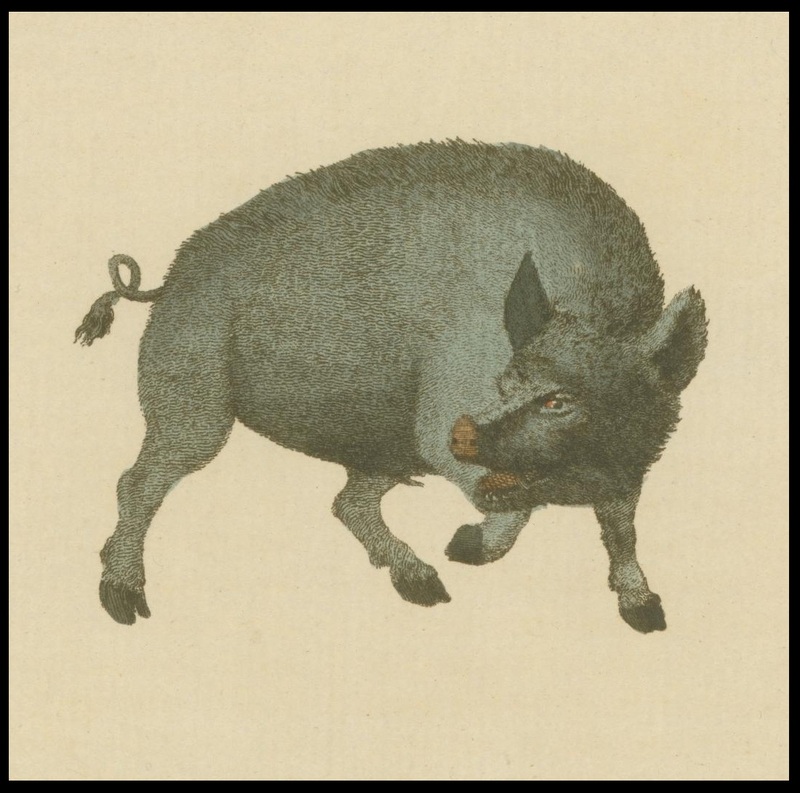 With Accurate Representations of the Most Curious and Beautiful Animals, Elegantly Coloured. By William Frederic Martyn**, Esq'. Both volumes were reissued by Gale in 2010: Volume 1. and Volume 2. 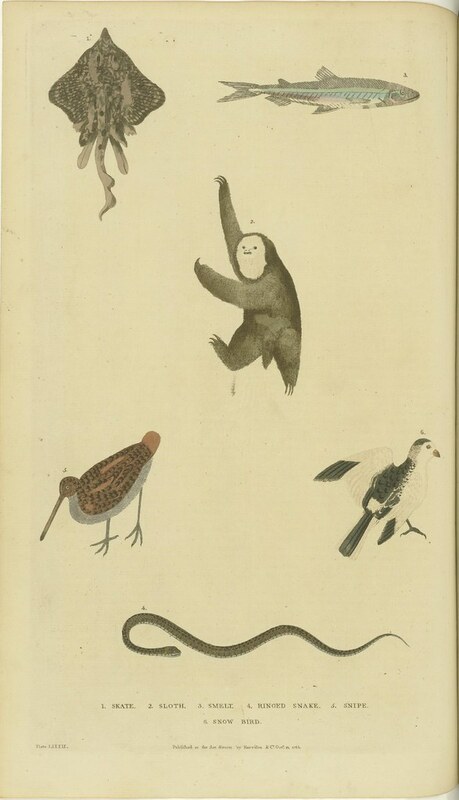 The illustrations below are courtesy of Brown U's JCB Library. Cachalot is another word for the sperm whale, Physeter macrocephalus, whose range is the entire ocean except the north and south poles. It has not been possible to identify the calandra which the text states was found in Carolina, but it may be a lark bunting, eastern meadow lark with non-breeding plumage, a brown thrasher, or a song sparrow. The Brazilian weasel may be the crab-eating raccoon, Procyon cancrivorus, whose range is from Costa Rica to northern Argentina. The wolverine, Gulo gulo, is native to northern North America, Europe, and Siberia. The sloth, of the genus Bradypus, is native to Central and South America. The sloth shown here is three-toed. The snow bird is the snow bunting, Plectrophenax nivalis. It is a native of the Arctic; Martyn says this specimen came from Hudson Bay. The scientific name of the American bison is Bison bison; its range was the grasslands of North America. 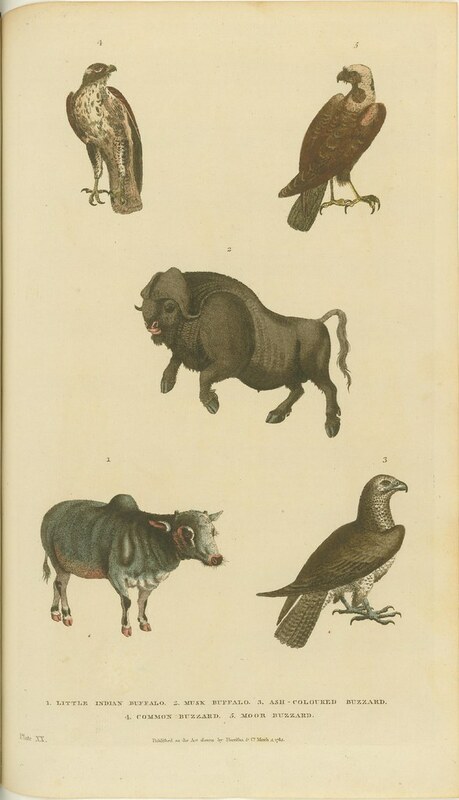 Text states that the musk buffalo or muskox (Ovibos moschatus) and ash-colored buzzard are both found around Hudson Bay. The ash-colored buzzard may be the rough legged hawk, Buteo lagopus. Text states that the greater bullfinch and North American bullfinch are both found in America. 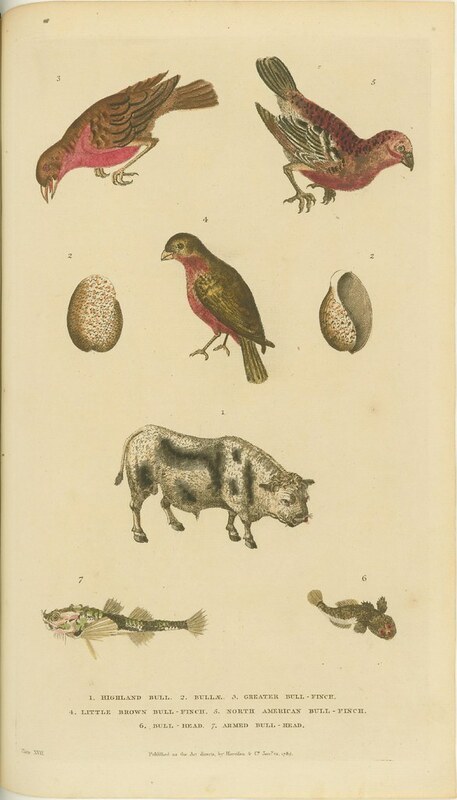 They are, perhaps, respectively the purple finch, Carpodacus purpureus, and the pine grosbeak, Pinicola enucleator. The true bullfinch is not native to the Americas. Text describes the brown bear, Ursus arctos, as being commonly found in Canada. The white or polar bear, Ursus maritimus, is found throughout the Arctic Ocean. The beaver is the only member of the genus Castor; the text notes its intellectual and social sophistication. Although the honey bee is not native to the Americas, other bees, such as the mason and leaf-cutter bees discussed in the text, are. The bib fish is native to Europe. 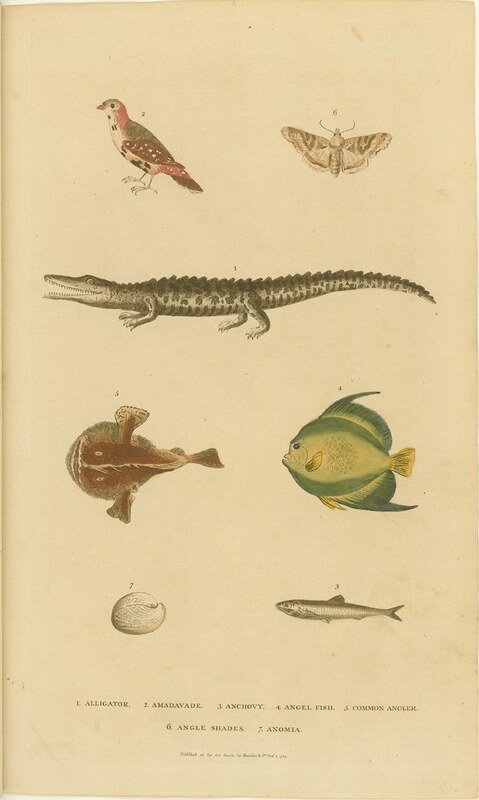 Brown University's John Carter Brown Library hosts 70 (out of 100 in total) hand-coloured plates from the 1785, 2-volume publication by William Frederic Martyn**: 'A New Dictionary of Natural History; or, Compleat Universal Display of Animated Nature'. 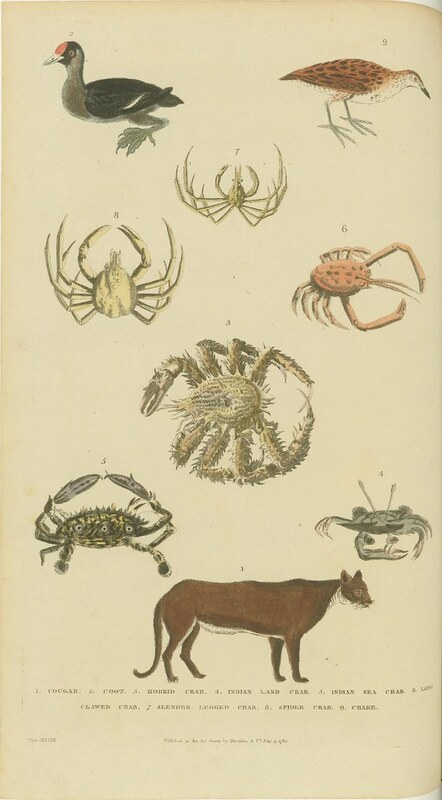 The - at times - humorous or eccentric A-to-Z configuration of species in the engravings, based on common names, makes a little more sense when it's discovered that William Frederic Martyn is a pseudonym** for William Fordyce Mavor. Mavor (1758-1837) was an educator and a prolific author and the main target of his books was children. 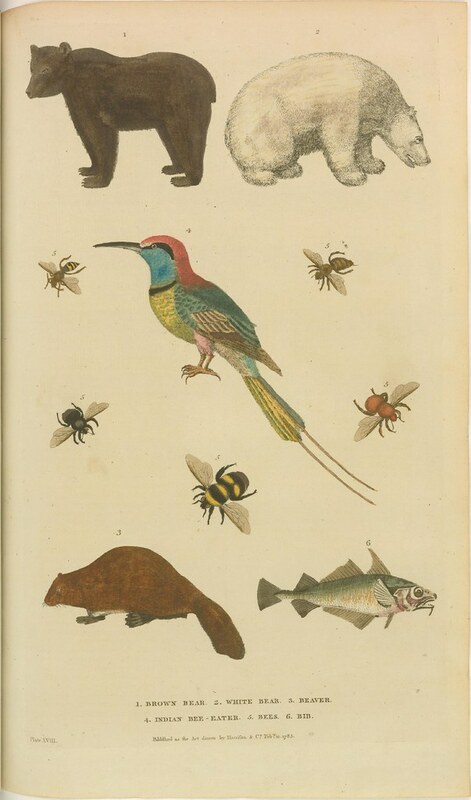 The illustrations are said to be by, or after, the English entomologist and engraver, Moses Harris. 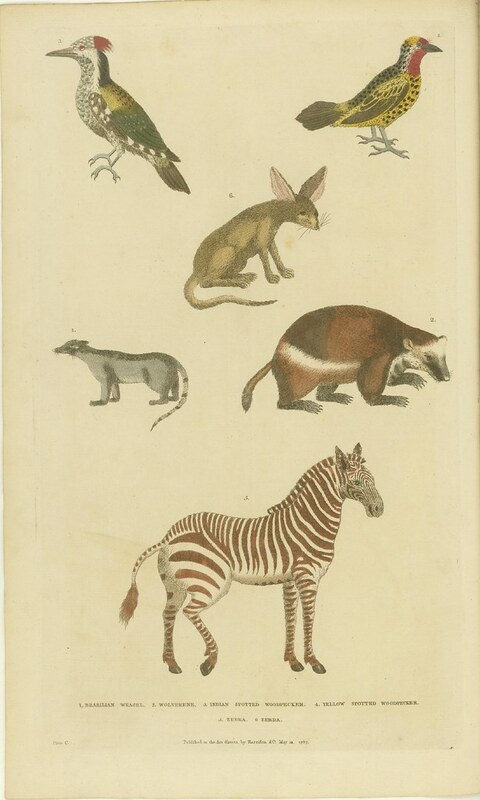 His designs were based on specimens from the intriguing Leicester Square museum, Holophusikon. Also known as the Leverian Museum, after its owner, Sir Ashton Lever, the Leicester House establishment was a veritable homage to the Wunderkammer aesthetic, operating as a Museum of Curiosities in London from 1775 to 1786. 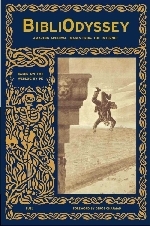 William Fordyce Mavor: biography | Worldcat | Internet Archive | The Online Books Page | Amazon. 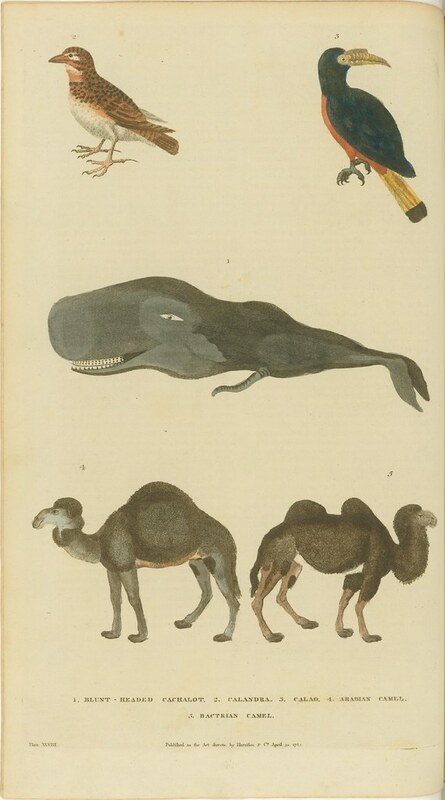 'A New Dictionary of Natural History' at Amazon: Volume 1 | Volume 2. 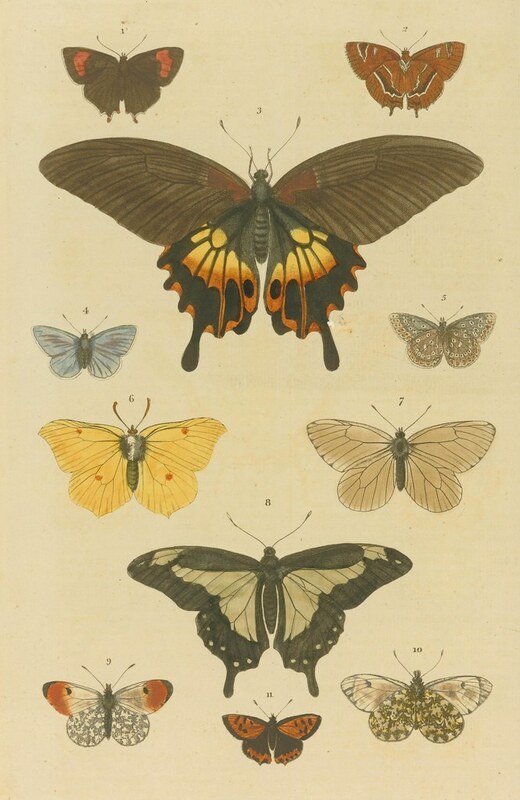 Only the broad green-barred swallow-tail butterfly (6) is stated as being from the Americas in the text. It was seen in Jamaica and Brazil. However, the butterfly named and described is not consistent with the image. Very much enjoyed! -- Thank you! 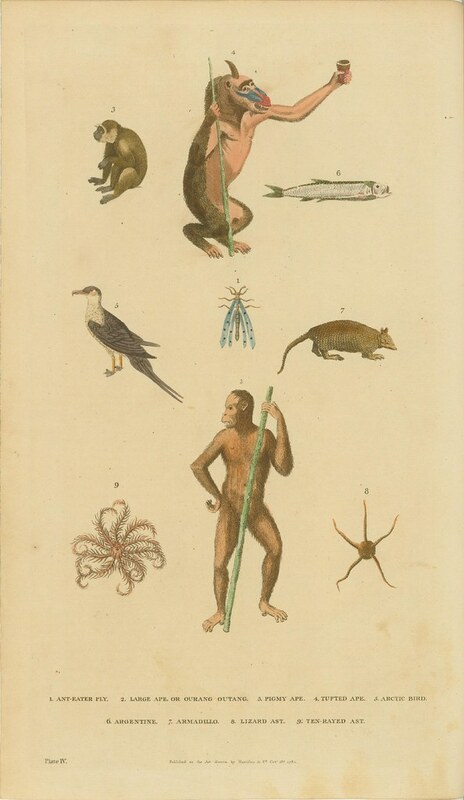 That "ape standing with a stick" trope or theme or idea is a fairly common way of depicting comparative anatomy that involves humans and apes. The earliest example that I recall is The Anatomy of a Pygmie by Edward Tyson. I think it's the origin of this species of illustration *boom tish*. Beautiful, I just discovered you, and I am sure your Blog will serve to inspire me.